In case you haven’t heard yet, Cassandra Clare released her final installment in the Mortal Instruments series last week – City of Heavenly Fire. If you don’t know what I’m talking about, I’m not sure you’ll quite understand the majority of this post, but feel free to keep reading if you are interested in my opinions on the stupid term “love triangle”. I should say right now that there are minor spoilers about various teen fiction novels in this post, but nothing that would change your experience of any of the stories – for example, NEWS FLASH! Edward loves Bella. Jacob also loves Bella. Bella loves both of them. See – you knew that already, didn’t you? After years of keeping things just because they were nice, because they might fit “one day”, or because I might want to wear them “some time”, I’ve given up on the over-inflated wardrobe of clothes I never wear. Don’t get me wrong, even with whittling down my extensive collection, I’ve still got tons of clothes – it kind of comes with the territory, as someone who really likes bright colours and unique pieces – but I now know that every piece is something that I both enjoy wearing and that I should wear. How did I get to this point, you ask? Well, I would love to share my process. Find your passion and Crush It! It was an interesting read, making me think about how to create an online presence and ways to capitalize off of it moving forward. Gary Vaynerchuk is just full of ideas for promoting a brand through social media and online marketing, but at the very core of his strategy is the fact that whatever you do, you should be passionate about it. This leads me to wanting to talk about my passion. I’ve thought for awhile about starting a blog specifically to discuss events and share my event planning experiences and expertise, but I have yet to find the time to pull something like that together, so for now, a snippet here and there on my personal blog will have to do. I’ve made moves this year toward gaining experience in events and learning more about the event industry in general, so I’ll try to share some of that newfound knowledge here. I knew for years that I enjoyed being involved in planning and volunteering for a variety of different events, but I never really gave a thought to the fact that I could have a career doing something that is just that much fun! I made this realization relatively recently – after an only slightly related university degree, of course – and now I’m constantly looking for ways to learn and develop in this area. I recently started a job as an Event Coordinator with the Alberta Diabetes Foundation, and there are days that I can’t believe I get paid to work in events. There are also other days that are chock full of frustrating emails and phone calls, and last minute crises – and yet, the feeling of seeing an event come together makes it all worth it. Working in events isn’t for everyone, but I’m glad I’ve finally figured out that it is for me. 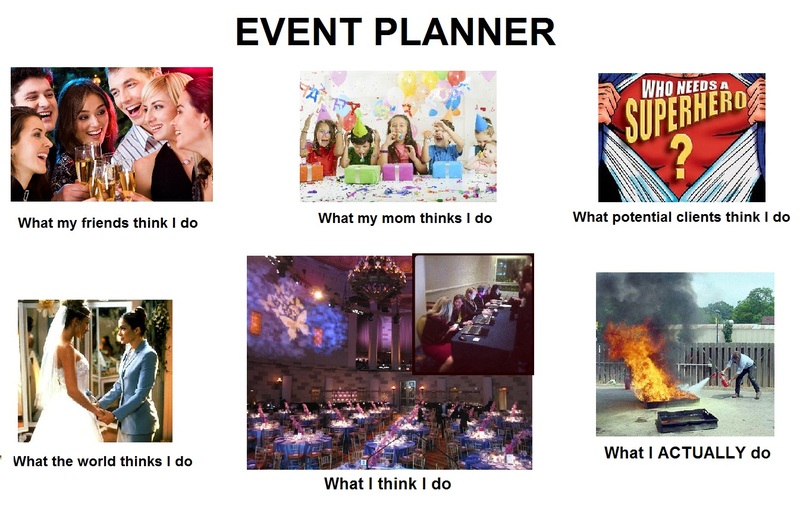 Event planning in a nutshell. Basically, the point of this post is that it’s important to figure out what your passion is. In Vaynerchuk’s book, he is adamant about the belief that any passion can be made into a career, and he uses examples from accounting to gardening to business development. With today’s online world, I think he’s right – you just have to be excited and knowledgeable and willing to put in the work. There is someone out there that wants to hear your expertise. You just need to find them. It has come to my attention that I have stopped blogging. This was definitely not by intention… it was just something that seemed to fall away when I got busy with work and life. But I’ve decided to jump back on the blogging train. And what better way to do so than to start a discussion of the story of the hour, The Hunger Games? I will preface this by saying that I am definitely a fan of these books, and I had gone to the movie twice by 2 PM on Friday, March 23rd (which is especially impressive given that it opened at midnight that Thursday night). This movie has been a huge story in the entertainment world, which has pulled the books into the spotlight again as well. For those readers that have not heard of this dark and intriguing novel-turned-movie, I guess I can give a brief overview. The Hunger Games is the first in a trilogy of three books by Suzanne Collins. These novels are set in a post-apocalyptic society, in a country called Panem which is located somewhere in what is known today as North America. Panem is made up of 12 Districts, which are all ruled by a city called the Capitol. The people of the Capitol live a life of indulgence and excess, while the people of the Districts have barely enough to get by – they work to supply the Capitol with everything they need to sustain their frivolous lifestyle. Every District has its own industry, each of which is necessary to provide for the Capitol. There was once a District 13, which the Capitol destroyed during a rebellion years before. As a reminder to the remaining Districts about where the true power lies in Panem, and as a warning against uprising, rebellion, and revolution, the Capitol holds the Hunger Games every year. Each District must offer up two tributes between the ages of 12 and 18 to participate in these Games – one boy and one girl. These individuals are elected in a lottery that ensures the poor are the most at risk for selection as children are given food for their families in exchange for submitting additional entries of their own name. The “winners” of this lottery in each District are sent together into an arena to fight to the death. The individual that emerges is declared the “Victor” and is provided for by the Capitol for the rest of his or her life. The entire Hunger Games is broadcast across Panem, and the masses forced to watch. In the Districts, this is done with sadness as they watch their own children fight, kill and die. In the Capitol, the Games are viewed much in the way that we watch reality television or sport broadcasts today. The frivolous, privileged, often silly residents of the Capitol place bets on tributes, cheer for kills, gossip about the Games on the streets, and view the tributes and eventually the victor as celebrities. The Hunger Games follows the adventure of one girl from the poor District 12, Katniss Everdeen, who steps up to volunteer as tribute when her 12-year-old sister’s name is chosen in the lottery. Katniss’s story is definitely a part of the reason that this novel and movie has been so successful, but I am not going to go into details about that. In this discussion, I would like to focus on the underlying themes of the premise of the novel. It is these themes that make these books appeal to a much broader audience than just those that read teen fiction novels. Though there are themes of rebellion and revolution in The Hunger Games, these are much better developed later in the series of the books. The idea of revolution is maybe a little more present in the movie with riots in District 11 shown during the Games. I find it interesting that the whole reason the Capitol stages a Hunger Games each year is to keep the masses from rebelling, but in Mockingjay, the third book, it ends up being Katniss’s involvement in the Games that paves the way for revolution. In the story, the Hunger Games themselves become a comment on real-world society’s love for reality TV and the desire we have to watch people do horrible things to one another. Of course, we do not put people in an arena and watch them fight to the death, but reality TV franchises are always pushing the boundaries for the big shock that will result in being the show that everyone is talking about. Shows like Fear Factor and Battle of the Exes have been known to make people do things that are dangerous – why do we enjoy watching other people go through frightening or painful experiences? There is a certain shock value in the morbid fascination the people of the Capitol have with watching children kill other children, but this fascination is not so different from my own desire to discuss Courtney Robertson’s actions the night after an episode of The Bachelor – I mean, she is a real person, and it may be entirely unfair the way she was portrayed on the show. Regardless, we love to hate her and at the same time love to watch her do and say horrible things to the rest of the girls. Why do we, as a society, get enjoyment from that? Before reality TV became popular, the only spectacle that people could view that did not have a predetermined ending was sport. The Hunger Games are promoted and enjoyed in the same way today’s society enjoys a hockey game, or a mixed martial arts fight, or any number of sporting broadcasts. Bad things can happen during these games too – does that make our fascination with them morbid as well? And what do we love more than a hero in today’s society? Think the guy or girl that gave it all to win the championship in any sport – isn’t this was the victor ends up being once the Games are over? The Hunger Games is about more than just the love triangle that seems to be so prevalent in all media surrounding the story. The background of the story is a comment on today’s society, and an interesting new perspective on our consumption of sport and spectacle.